The Norrbottenspets is a small, spitz-type hound of Nordic origin that uses sight, scent, and hearing to hunt forest game and then holds the game at bay and calls the hunter with high-pitched vocalizations. To navigate the rough terrain and climate of Scandinavian forests and hold large dangerous game, like moose, Norrbottenspets are extremely agile, rugged, and weatherproof with a fearless attitude, while at the same time kind and affectionate companions at fireside and home. Norrbottenspets exhibit no extremes in physical characteristics because they must do all things well. The ideal Norrbottenspets is a compact, well-muscled, yet agile dog standing no greater than 18½ inches at the withers. 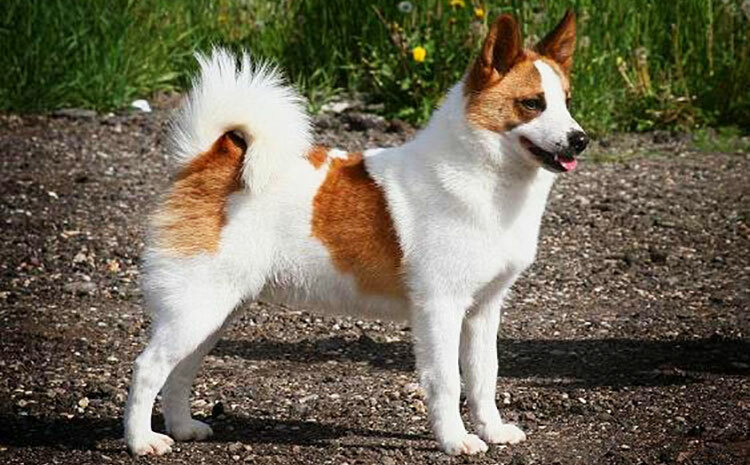 The ideal Norrbottenspets has brown, almond shaped eyes, slightly over medium size upright ears, an unaltered and naturally presented close-fitting double coat of white with a red or yellow mask and spots, a loosely curled tail with the tip touching the hip, bold movement, and a self-confident and daring demeanor. Norrbottenspets are never nervous, shy, or aggressive. Norrbottenspets vocalize when excited. Sexual dimorphism is clearly apparent in Norrbottenspets. Norrbottenspets are presented on the ground or on a ramp for examination by a judge. Size - The desired height for males is 17 to 18½ inches; females, 15½ to 17½ inches. Noticeably over size or under size is a fault. Proportion - Males are slightly rectangular; females are a little longer. The depth of the chest should be one-half the height at the withers. Substance - Norrbottenspets are compactly built without being bulky. They have sinewy, well-developed muscles and are without extremes in angulation or physical features. Bone dimension gives rugged yet graceful proportions. Sexual dimorphism is clearly apparent, with females appearing feminine yet durable. The head is strong, clean cut, and evenly tapering towards the nose when viewed from above and from the side. Sexual dimorphism should be clearly visible in the structure of the head. Expression - Norrbottenspets appear calm, keen, and attentive, with the head carried high and a fearless attitude. Eyes - The eyes are medium sized, almond-shaped, and obliquely set. Irises are dark brown and eye rims are pigmented. Ears - The ears are high set and erect, slightly over medium size in proportion to the head, with hard leather and slightly rounded tips. Skull - The skull is relatively broad with the forehead slightly arched and the top of the skull rather flat. The superciliary arches are well marked, the nosebridge is straight, and the cheeks are defined. The stop is evident but only slightly marked. Muzzle - The muzzle is half the length of head or somewhat shorter, clearly tapering towards the tip of nose, but never snipy. The planes of the muzzle and skull are parallel. Nose - The nose is black. A flesh colored or liver brown nose is a fault. Lips - The lips are thin, tightly fitting, and pigmented. Teeth - Well developed jaws and teeth meet in a scissors bite. Missing teeth except for the first premolar are a fault. Neck - The neck is moderately long in proportion to the body, dry and muscular, with a slight arch and good reach. Topline - The withers are defined with the back and loin level and the croup slightly sloping. Body - The depth of the body is half the total height at withers. Chest - The chest is long, oval in shape, and of normal width, with well-developed last ribs. The forechest is well developed and well defined. The lowest part of the ribcage is in line with the elbow or just below it and merges softly into the bellyline. Tuck up - The bellyline is only slightly tucked up. Back - The back is short, level, and springy with strong muscles. Loin - The loin is short and broad. Croup - The croup is moderately long and broad, slightly sloping, with well-developed and hard muscles. Tail - The tail is rather high set and carried in a high curve, loosely curled with the tip of tail touching the side of upper thigh when in motion. When stretched, the length of the tail should not reach below the hock. A stumpy tail or a docked tail is a disqualification. The forequarters are neither narrow nor broad, with legs straight and parallel, and without extremes in angulation. Shoulder Blades - The shoulder blades are long, broad and muscular, forming well defined and developed withers. The shoulder blades are close fitting to the chest and set obliquely, with great freedom of movement. Upper Arm - The upper arm is the same length as the shoulder blade and forms a right angle with the shoulder blade. The upper arm is strong and well developed, lying close to the chest but with great freedom of movement. The upper arm abducts, extends laterally away from the body, forming up to a 90 degree angle with the midline of the chest. Elbow - The elbow turns neither in nor out. Forearm - The forearm is straight with strong bones and lean but flexible muscles. Pasterns - The pasterns are strong and slightly sloping. Dewclaws - Foreleg dewclaws are present and functional. Feet - The feet are small and strong, pointing straight forward. The toes are well arched and tightly knit with well-developed and hard pads. The hindquarters are without extremes in angulation and mirror the angulation of the forequarters. The hindquarters stand parallel when viewed from behind. Upper thigh - The upper thigh is proportionately long with strong muscles and forms a right angle with the pelvis. Stifle - The stifle is strong. Second thigh -The second thigh is well muscled and forms a marked angle with the upper thigh. Hock - The hock joint is strong. Pasterns - The rear pasterns are rather long, dry, and elastic. Dewclaws - Rear dewclaws are absent. Feet - Feet are as described above. The Norrbottenspets is double coated. Topcoat - The topcoat is hard, short, and straight, rather close lying with different lengths: shortest on the nose bridge, the top of skull, the ears and the front of the legs; longest on the neck, the backside of the thighs and the underside of tail. An erect coat is a serious fault. Undercoat - The undercoat is fine and dense. Grooming - The Norrbottenspets is shown naturally with no trimming or fluffing of the coat. A dog exhibiting an erect coat instead of a rather close lying coat, whether the erect coat has been produced by grooming or by a naturally occurring coat fault is to be penalized as to be effectively eliminated from competition. The Norrbottenspets has a base color of pure white overlaid with a colored mask covering the sides of the head and the ears and with well-defined and well-distributed body patches. The ideal overlay color is any nuance of red or yellow. Patches on the body are fairly big. The gait of the Norrbottenspets is smooth and free with strong drive, covering lots of ground. The topline remains firm in motion and the hind legs travel parallel. Individuals with great lateral freedom of movement in the forequarters typical of the breed can exhibit looseness in the foreleg movement that should not be penalized. Norrbottenspets are calm, keen, and attentive with a kind disposition; selfconfident, they carry their heads high with a fearless attitude. Dogs that vocalize in the ring due to excitement should not be penalized. Norrbottenspets are never nervous, shy, or aggressive. A stumpy or docked tail. Click Here to Learn about breeder background checks on Norrbottenspets breeders if you are looking for Norrbottenspets puppies for sale. Click Here to learn how ResearchBreeder.com can help you find healthy Norrbottenspets puppies for sale. Click Here to order a Breeder or Kennel Background Check on Norrbottenspets Breeders that may have Norrbottenspets puppies for sale. Click here to find the national breed club for Norrbottenspets puppies for sale. Click Here to purchase a list of approved ResearchBreeder.com Norrbottenspets Breeders who have Norrbottenspets puppies for sale.